Greetings friends! 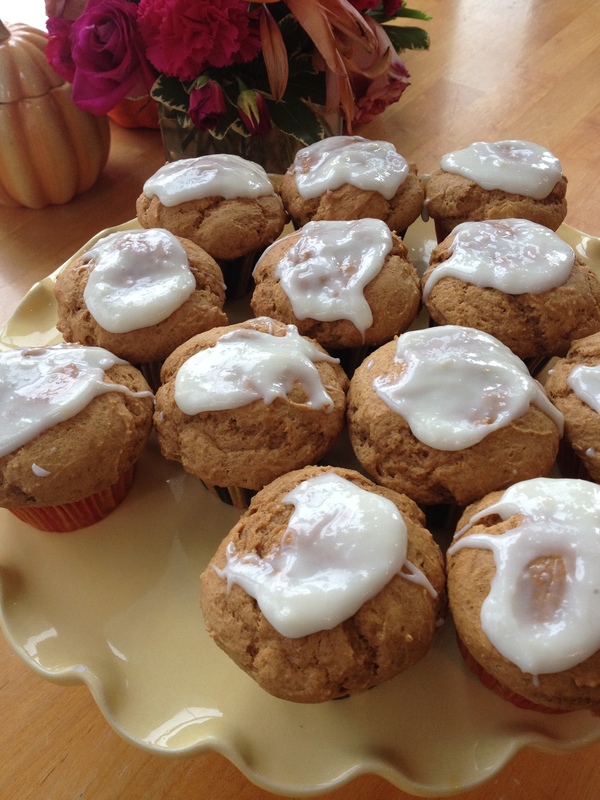 I discovered a yummy pumpkin muffin this morning that is pretty healthy and a huge hit with the kiddos, especially because it had frosting! It goes right along with my love of everything pumpkin flavored and would be most wonderful with a Pumpkin-Spiced Latte. Hope you enjoy this treat as much as we did! Preheat oven to 350 degrees. Spray muffin tin, even the top since muffins will overflow, with non-stick cooking spray or add muffin liners. Using mixer, cream butter and both sugars, add eggs, vanilla, milk, half and half and pumpkin puree. Combine dry ingredients, flours, baking powder, salt, pumpkin pie spice and cinnamon. Divide batter among 12 muffin tins. They will be very full. Bake for 25-30 minutes until cooked through. Cool in pan about 20 minutes. Move muffins to a rack to finish cooling. Mix glaze ingredients and drizzle over muffins. I calculated each muffin to be 7 PointsPlus. Posted in Breakfast, Healthy Baking and tagged muffins, Pumpkin. Bookmark the permalink.